When my husband, little boys and I first started eating a Plant-Based Diet we ate a lot of comfort foods; Chili, Lentil or Quinoa Tacos, Nachos, Baked Potatoes were normal fare for us. I also made baked goods to help ease us off the junk food we were accustomed too. Since our teenage daughter had decided to live with us I thought it would only be considerate to eat more of these types of foods. One of the problems is we started eating plant-based in the winter, it is summer now so some of the foods we are then just don’t seem as appealing now. My husband and I are happy with simpler meals, we can eat rice, lentils, and leafy greens and be satisfied. That is a tall order and would have been impossible for us in the beginning. It took a while for our taste buds to accept the kinds of food we like now. A few days ago I made baked potatoes for dinner. I had some chili in the freezer that I thought would make a perfect accompaniment. I was right! Both of our teenagers liked it and my daughter even requested that I make it again this week. Yesterday my daughter flipped through my new Forks Over Knives Cookbook and picked out recipes she was interested in; I’m hoping to try a few this week. Breakfast is toast, fruit, muffins, and cereal more often than I would care to admit. We have oatmeal once or twice a week, usually with raisins, cinnamon, and a touch of agave. Lunch is usually leftovers, nut butter sandwiches, bean and grain bowls, Big Salads, or bean burritos. Snack ideas include: hummus with veggies, chips and salsa, smoothies, or fruit. Dinner this week will include 3 Bean Chili, Beans and Rice, Black Bean Burgers with Twice Baked Potatoes, Quinoa or Lentil (or both) Taco Salad. There are three nights this week with activities so we will be eating early, late, or out on those days. If you are wondering how I have time to cook so much food let me assure you I’m not slaving in the kitchen every day. Yesterday I cooked a big pot of lentils and a big pot of brown rice. I soaked pinto beans last night and cooked them today. Even if I don’t get the black beans cooked I have enough pintos and lentil to get several good meals made. By cooking beans and other foods that take a long time during my “down time” I can get dinner together in about half an hour. While rice cooks, or beans heat up I can chop, steam, or otherwise prepare veggies. Summer favorites are a fresh black bean, corn, tomato medley with chips for lunch, or a big salad with figs, sprouts, and walnuts. Steal cut oats or an apple with almond butter in the morning. I find my main fail to be when dinner comes around. This a great blog you have. I like how humble the recipes are. Thank you Rachel! I hope you are recovering from your injuries quickly! I am sitting here hungry from reading the foods you mentioned. I wasn’t hungry at all before but it is such an appetizing list. I’m the opposite, dinner is the main time I even try. Breakfast and lunch are usually just something quick and easy. as per my particular health issues i’ve been told that my protein intake has to be high and if i have carbs that they should be balanced with protein to prevent a sugar crash. i notice that your meal plan is carb bent and was wondering how i would do this diet and get appropriate levels of protein? also, how do I reconcile that even holistic nutritionists claim you have to up protein to lose weight? i find it hard to believe that i can get 20-30 g protein/meal recommended with beans, esp. since beans have carbs. so if i had rice and beans then the rice would be to many carbs for my situation. i really want to try this but am somewhat put off by the idea that i would be eating mouthfuls of beans and low GI veggies. help! Hi Patty, First of I want to say that if your situation is unique I’m probably not the best on to talk to. I don’t have any special training that would qualify me to give any medical advice. You may want to contact Eileen who I talk about in My Weight Loss Story or contact the Wellness Forum. It is headed by Dr. Pam Popper, she has helped one of my friends who had a unique situation too. You may be able to find a dietician who could help as well. There is a new book out called “the Starch Solution” that may answer some questions. I haven’t read it (yet) but I trust the author to provide sound advice. Many people think that protein can only be found in meats but beans, grains, nuts and seeds are great sources also. My husband and I have both lost weight and felt better than ever by eating a plant-based diet. I’ve heard several doctors say you can’t be protein deficient unless you are calorie deficient. Another great thing about eating a plant-based diet is the variety. 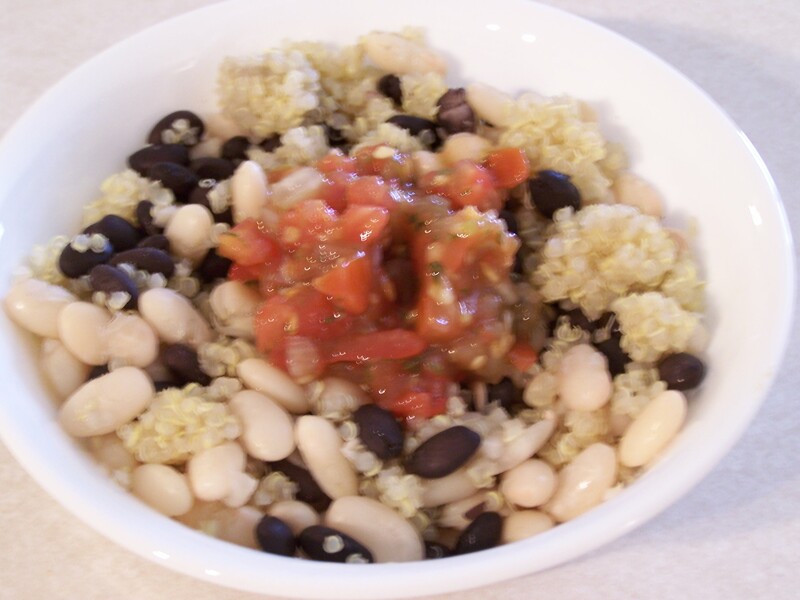 There are so many different beans, grains, veggies, and fruit that I never tried before. I’d like to encourage you to seek out someone trained to help. I’m hesitant to provide anything that could be considered “medical advice” but I do think a plant-based diet will benefit anyone who commits to it.